The National Center for Supercomputing Applications (NCSA) is a state-federal partnership to develop and deploy national-scale cyberinfrastructure that advances research, science and engineering based in the United States of America. 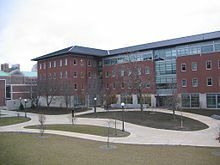 NCSA operates as a unit of the University of Illinois at Urbana–Champaign, and provides high-performance computing resources to researchers across the country. Support for NCSA comes from the National Science Foundation,   the state of Illinois, the University of Illinois, business and industry partners, and other federal agencies. This page was last edited on 26 November 2018, at 01:24 (UTC).